I am proud to serve as the State Senator from Illinois’ 52nd District, representing Champaign and Vermilion counties. I hope you’ll find this site a useful resource in keeping up to date with what’s happening in our district and in Springfield. Please contact any of my offices with questions or ways I can better serve you. It is my honor to represent you in Springfield. 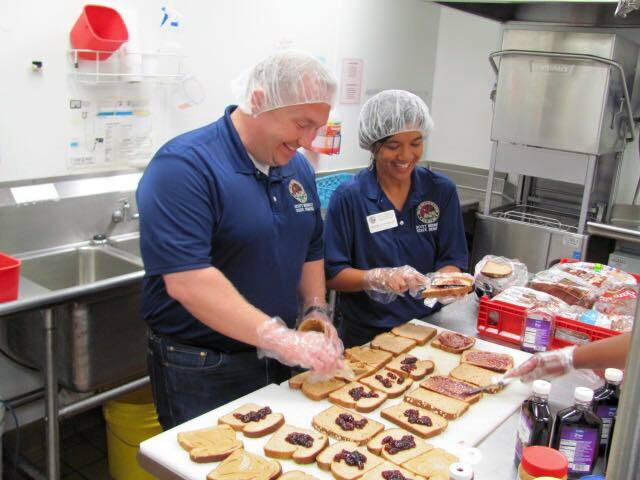 CHAMPAIGN– To raise awareness about the importance of community food pantries and soup kitchens, Senator Scott Bennett (D-Champaign) will be serving lunch at the Daily Bread Soup Kitchen. Bennett is currently participating in the SNAP Challenge to experience what life is like for millions of low-income Americans living on an average daily allowance of $4.40. Many of our neighbors are experiencing difficult times and rely on area soup kitchens to receive a decent meal. However, due to the budget impasse, soup kitchens in Champaign-Urbana are left no choice but to close their doors. The Daily Bread Soup Kitchen will be attempting to serve additional families without additional funding. This news comes in light of the Daily Bread Soup Kitchen’s recent purchase of a new facility to allow them to serve more residents. However, they still need to raise $300,000 for renovation costs. Those interested in sending a tax deductible donation can send donations to Daily Bread Soup Kitchen at P.O. Box 648, Champaign, IL 61824. CHAMPAIGN- In conjunction with Hunger Action Month, State Senator Scott Bennett (D-Champaign) is hosting a food and fund drive from September 14 through 30 in Danville and Champaign. The need for donations does not end with the holiday season. Local food and fund drives are the key sources of food and funding in their effort to alleviate hunger in our community. • 17.4 percent of households include someone who is a veteran or who has served in the military. • 82 percent of households report purchasing inexpensive, unhealthy food because they could not afford healthier options. • 80 percent of households report having to choose between paying for food and paying for medicine or food. 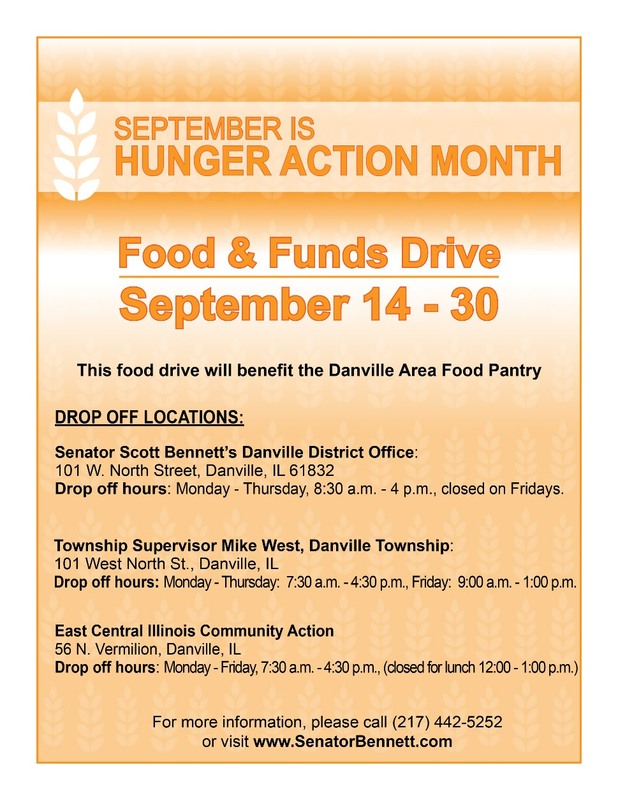 Vermilion County Food Drive Information: State Senator Scott Bennett (D-Champaign), Danville Township Supervisor Mike West and Central Illinois Community Action are community-wide food and fund drive to benefit Danville Township Food Pantry September 14 through 30. Drop off hours: Monday - Thursday, 8:30 a.m. - 4 p.m., closed on Fridays. 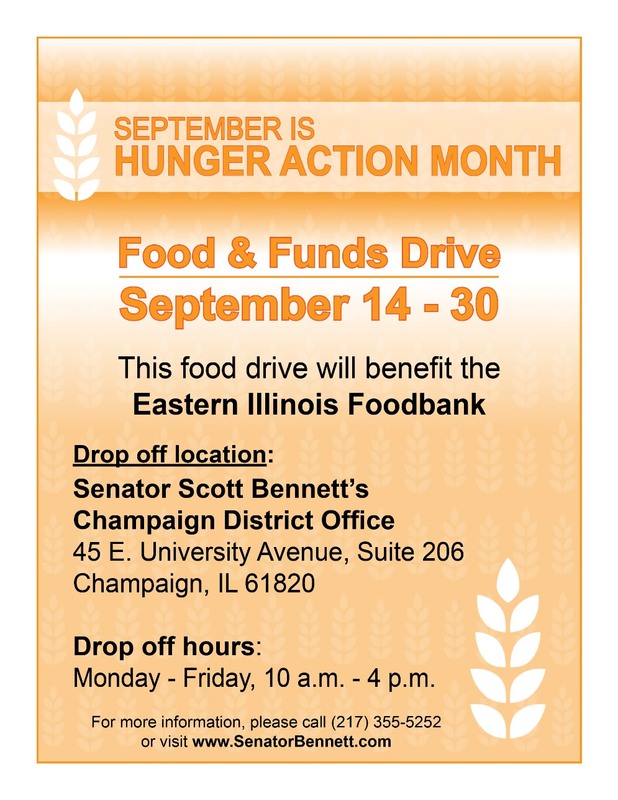 Drop off hours: Monday – Thursday, 7:30 a.m. - 4:30 p.m., Friday: 9:00 a.m. - 1:00 p.m.
Champaign County Food and Fund Drive Information: State Senator Scott Bennett (D-Champaign) is hosting a food and fund drive to benefit the Eastern Illinois Foodbank from September 14 through 30. Click here to make a monetary donation. Drop-off hours: Monday through Friday, from 10 a.m. to 4 p.m. Please call Sen. Bennett’s full-time Champaign office at (217) 355-5252 with any questions or concerns. 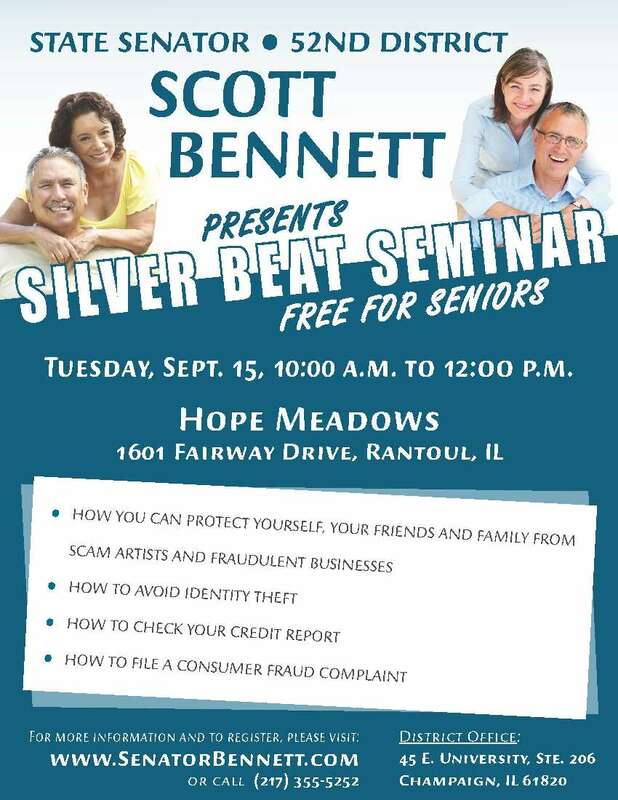 RANTOUL – Working to bring state services to seniors in Rantoul, Illinois State Senator Scott Bennett (D–Champaign) is hosting a free senior workshop on September 15 at Hope Meadows. A representative from the Illinois Attorney’s General’s office will be present to educate seniors with updated information on financial exploitation and scams, their rights under new credit card rules and how to protect themselves and friends from scam artists. To accommodate all guests, Sen. Bennett is asking participants to register by calling his full-time Constituent Service Office in Champaign at (217) 355-5252 or click here. SPRINGFIELD- As college students begin to head back to campus, State Senator Scott Bennett (D-Champaign) passed legislation to fund state college assistance grants. Under Senate Bill 2043, the Monetary Award Program (MAP) grants will continue to make college an option for students across Illinois. This state assistance provides need-based aid to help pay for tuition and fee costs to help eliminate excessive college loan debt. “Illinois students shouldn’t be discouraged from attending one of our public universities or community colleges due to financial need,” Bennett said. “The legislation we passed today will help more students obtain a college education without further jeopardizing their financial health. The Illinois Student Assistance Commission estimates that under Senate Bill 2043, that 125,000 to 130,000 eligible students will be approved for MAP grant assistance. Last year, 6,697 students, approximately 25 percent of undergraduates at the University of Illinois at Champaign-Urbana received MAP grant assistance. 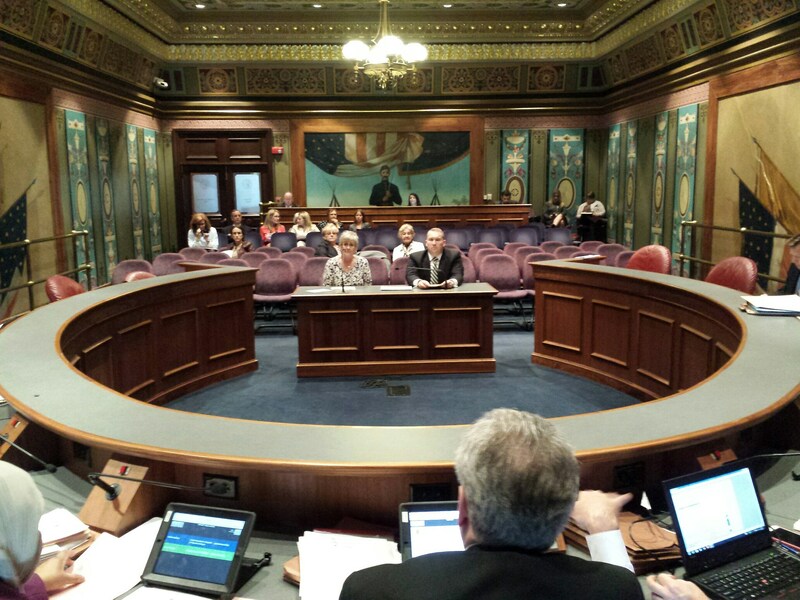 Senate Bill 2043 passed the Senate 37-0-14 and now moves to the House for consideration.